Hyundai India has released an official statement today where it mentions, "Senior Vice President Seon Seob Kim, head of Business Operations Strategy Division, will become Head of Hyundai Motor India Headquarters". Kim takes over the head of Hyundai role from Y K Koo who took over the role in November 2015. Kim is presently serving as the senior vice president, head of Business Operations Strategy Division at Hyundai Motor Company. The release also mentions, "Executive Vice President Seung Jin Kim, head of Global Future Strategy TFT, has been appointed to Head of Hyundai Motor Global Operation Division. In his new role, Kim will oversee Hyundai Motor's sales outside of Korea." It is already known that Y K Koo played an instrumental role in launching the new-gen Hyundai Santro in India. The all-new Hyundai Santro has been launched in India, with prices starting at Rs 3.90 lakh for the base, Dlite version. 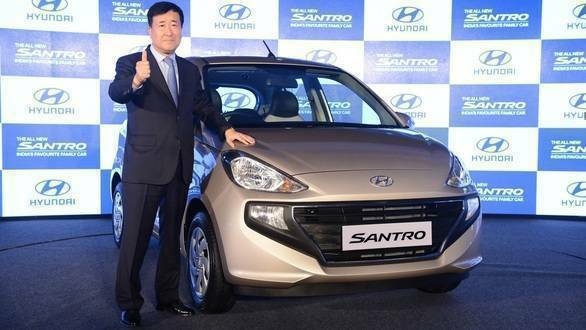 The Santro is easily the most popular car from Hyundai in India and in fact was the very car that made the Korean manufacturer a household name. Interestingly, the new Hyundai Santro has been launched just a little over 20 years since the original was launched, back in September 1998. Needless to say Hyundai hopes the new Santro will repeat the success of its original and will do well as an entry-level family hatchback. In addition to the Santro, Y K Koo also played a pivotal role in the launch of Grand i10 facelift, Elite i20, Accent, new-gen Verna, Elantra, Creta SUV and the premium Tucson. Y K Koo has already completed 3 years in India. Hyundai states that the change in leadership appointments at key overseas operations to strengthen organizational agility to adapt to a rapidly-changing business environment. The appointments will take effect December 1.